Ambassador of Korea Won-sam Chang will be the special guest speaker at a session on ‘Bilateral Trade between Sri Lanka and Korea’ organised by the National Chamber of Commerce of Sri Lanka, on Thursday 30 June from 3 p.m. to 4:30 p.m. at the Chamber Auditorium No. 450 D.R. Wijewardena Mawatha, Colombo-10. The Ambassador will be accompanied by four of Korea’s governmental bodies based in Sri Lanka: KOTRA, KOICA, Korea EXIM Bank, and KOPIA. They will brief their respective activities in Sri Lanka, with a focus on the economic cooperation between the two countries. The participants will get an opportunity to interact with the Ambassador of Korea and representatives of the Korean Trade Agencies with regard to their services and trade for the Sri Lankans. 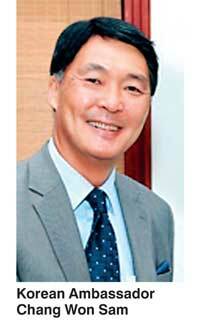 Korea has been one of the most important sources of foreign direct investment to Sri Lanka. At present there are 116 Korean projects/companies in operation in Sri Lanka; the main sectors in which the South Korean investors have invested in Sri Lanka are textile and apparel, railway infrastructure, housing and property etc, which are more labour incentive industries. Such investments have contributed towards expansion of manufacturing activity and employment generation as well. Over 6,000 Sri Lankans are presently employed in South Korea under skilled workers category. Apparel is the major export item from Sri Lanka, also coconut fibre, articles of apparel and clothing, gloves, activated carbon, aluminium etc. Sri Lanka’s major imports from Korea is petroleum oils and oils obtained from bituminous minerals, other than crude, iron and steel, knitted or crocheted fabrics, machinery etc. For reservation of the session, kindly contact chamber: TP 4741788 Mrs Fouad; email pa@nationalchamber.lk; nirmani@nationalchamber.lk.